With thousands of patients recovering from surgery, more than 70,000 fresh dressings and bandages are needed each year. Bandages are essential to recovery and healing because they keep incisions clean. Can you read this line? A child with untreated congenital cataracts cannot. In fact, it�s very possible that he has never seen his mother�s face. Cataracts are the most common cause of preventable blindness in developing countries. A fifteen-minute surgery onboard our hospital ship can restore sight and hope. Many eye diseases and conditions are highly treatable, and even preventable, with proper medical intervention. 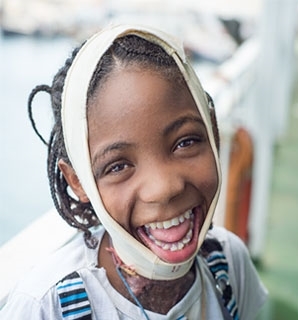 Mercy Ships works on your behalf to treat them all.